Dome’s striking design adds greatly to the style quotient of your desk or living room. 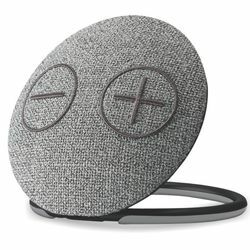 Nicely embroidered cotton cloth mesh texture on a solid dome-shaped speaker body gives a very unique and elegant look to the speaker. While it looks beautiful even when not playing music, it can surprise people with its powerful and clear sound quality. You can enjoy both wired and wireless music using either a 3.5mm Aux-In port or Bluetooth 4.1 connectivity. A strong 180 degree foldable ring at the base allows Dome to hang on wall, tilt or stand freely on desk - as desired by you. Nicely embroidered cotton cloth mesh texture on a solid dome-shaped speaker body gives a very unique and elegant look to the speaker. While it looks beautiful even when not playing music, it can surprise people with its powerful and clear sound quality. It can play upto 6 hours of non-stop music due to a built-in rechargeable lithium-ion 2000 mAh battery. There is a 5V/1A micro-USB port for charging the same. Dome is quick to connect and easy to use. The loudness levels are high enough to let everyone enjoy clear musical beats in your home or office. Users just need to connect his/her device via AUX cable with dome to experience the high quality music anywhere on the go.